Congenital heart defects are partly preventable through rubella vaccination, the adding of iodine to salt, and the adding of folic acid to certain food products. Some defects do not need treatment. Others may be effectively treated with catheter based procedures or heart surgery. Occasionally a number of operations may be needed, or a heart transplant may be required. With appropriate treatment, outcomes are generally good, even with complex problems. Heart defects are the most common birth defect. In 2015 they were present in 48.9 million people globally. They affect between 4 and 75 per 1,000 live births depending upon how they are diagnosed. About 6 to 19 per 1,000 cause a moderate to severe degree of problems. Congenital heart defects are the leading cause of birth defect-related deaths. In 2015 they resulted in 303,300 deaths down from 366,000 deaths in 1990. Signs and symptoms are related to type and severity of the heart defect. Symptoms frequently present early in life, but it is possible for some CHDs to go undetected throughout life. Some children have no signs while others may exhibit shortness of breath, cyanosis, fainting, heart murmur, under-development of limbs and muscles, poor feeding or growth, or respiratory infections. Congenital heart defects cause abnormal heart structure resulting in production of certain sounds called heart murmur. These can sometimes be detected by auscultation; however, not all heart murmurs are caused by congenital heart defects. The cause of congenital heart disease may be genetic, environmental, or a combination of both. Most of the known causes of congenital heart disease are sporadic genetic changes, either focal mutations or deletion or addition of segments of DNA. Large chromosomal abnormalities such as trisomies 21, 13, and 18 cause about 5–8% of cases of CHD, with trisomy 21 being the most common genetic cause. 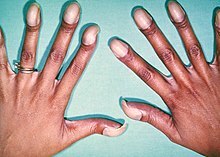 Small chromosomal abnormalities also frequently lead to congenital heart disease, and examples include microdeletion of the long arm of chromosome 22 (22q11, DiGeorge syndrome), the long arm of chromosome 1 (1q21), the short arm of chromosome 8 (8p23) and many other, less recurrent regions of the genome, as shown by high resolution genome-wide screening (Array comparative genomic hybridization). The genes regulating the complex developmental sequence have only been partly elucidated. Some genes are associated with specific defects. A number of genes have been associated with cardiac manifestations. Mutations of a heart muscle protein, α-myosin heavy chain (MYH6) are associated with atrial septal defects. Several proteins that interact with MYH6 are also associated with cardiac defects. The transcription factor GATA4 forms a complex with the TBX5 which interacts with MYH6. Another factor, the homeobox (developmental) gene, NKX2-5 also interacts with MYH6. Mutations of all these proteins are associated with both atrial and ventricular septal defects; In addition, NKX2-5 is associated with defects in the electrical conduction of the heart and TBX5 is related to the Holt-Oram syndrome which includes electrical conduction defects and abnormalities of the upper limb. Another T-box gene, TBX1, is involved in velo-cardio-facial syndrome DiGeorge syndrome, the most common deletion which has extensive symptoms including defects of the cardiac outflow tract including tetralogy of Fallot. The notch signaling pathway, a regulatory mechanism for cell growth and differentiation, plays broad roles in several aspects of cardiac development. Notch elements are involved in determination of the right and left sides of the body plan, so the directional folding of the heart tube can be impacted. Notch signaling is involved early in the formation of the endocardial cushions and continues to be active as the develop into the septa and valves. It is also involved in the development of the ventricular wall and the connection of the outflow tract to the great vessels. Mutations in the gene for one of the notch ligands, Jagged1, are identified in the majority of examined cases of arteriohepatic dysplasia (Alagille syndrome), characterized by defects of the great vessels (pulmonary artery stenosis), heart (tetralogy of Fallot in 13% of cases), liver, eyes, face, and bones. Though less than 1% of all cases, where no defects are found in the Jagged1 gene, defects are found in Notch2 gene. In 10% of cases, no mutation is found in either gene. For another member of the gene family, mutations in the Notch1 gene are associated with bicuspid aortic valve, a valve with two leaflets instead of three. Notch1 is also associated with calcification of the aortic valve, the third most common cause of heart disease in adults. Mutations of a cell regulatory mechanism, the Ras/MAPK pathway are responsible for a variety of syndromes, including Noonan syndrome, LEOPARD syndrome, Costello syndrome and cardiofaciocutaneous syndrome in which there is cardiac involvement. While the conditions listed are known genetic causes, there are likely many other genes which are more subtle. It is known that the risk for congenital heart defects is higher when there is a close relative with one. Known environmental factors include certain infections during pregnancy such as Rubella, drugs (alcohol, hydantoin, lithium and thalidomide) and maternal illness (diabetes mellitus, phenylketonuria, and systemic lupus erythematosus). Being overweight or obese increases the risk of congenital heart disease. Additionally, as maternal obesity increases, the risk of heart defects also increases. A distinct physiological mechanism has not been identified to explain the link between maternal obesity and CHD, but both prepregnancy folate deficiency and diabetes have been implicated in some studies. There is a complex sequence of events that result in a well formed heart at birth and disruption of any portion may result in a defect. The orderly timing of cell growth, cell migration, and programmed cell death ("apoptosis") has been studied extensively and the genes that control the process are being elucidated. Around day 15 of development, the cells that will become the heart exist in two horseshoe shaped bands of the middle tissue layer (mesoderm), and some cells migrate from a portion of the outer layer (ectoderm), the neural crest, which is the source of a variety of cells found throughout the body. On day 19 of development, a pair of vascular elements, the "endocardial tubes", form. The tubes fuse when cells between then undergo programmed death and cells from the first heart field migrate to the tube, and form a ring of heart cells (myocytes) around it by day 21. On day 22, the heart begins to beat and by day 24, blood is circulating. At day 22, the circulatory system is bilaterally symmetrical with paired vessels on each side and the heart consisting of a simple tube located in the midline of the body layout. The portions that will become the atria and will be located closest to the head are the most distant from the head. From days 23 through 28, the heart tube folds and twists, with the future ventricles moving left of center (the ultimate location of the heart) and the atria moving towards the head. On day 28, areas of tissue in the heart tube begin to expand inwards; after about two weeks, these expansions, the membranous "septum primum" and the muscular "endocardial cushions", fuse to form the four chambers of the heart. A failure to fuse properly will result in a defect that may allow blood to leak between chambers. After this happens, cells which have migrated from the neural crest begin to divide the bulbus cordis, the main outflow tract is divided in two by the growth a spiraling septum, becoming the great vessels—the ascending segment of the aorta and the pulmonary trunk. If the separation is incomplete, the result is a "persistent truncus arteriosis". The vessels may be reversed ("transposition of the great vessels"). The two halves of the split tract must migrate into the correct positions over the appropriate ventricles. A failure may result in some blood flowing into the wrong vessel (e.g.overriding aorta). The four-chambered heart and the great vessels have features required for fetal growth. The lungs are unexpanded and cannot accommodate the full circulatory volume. Two structures exist to shunt blood flow away from the lungs. Cells in part of the septum primum die creating a hole while muscle cells, the "septum secundum", grow along the right atrial side the septum primum, except for one region, leaving a gap through which blood can pass from the right artium to the left atrium, the foramen ovale. A small vessel, the ductus arteriosus allows blood from the pulmonary artery to pass to the aorta. The ductus arteriosus stays open because of circulating factors including prostaglandins. The foramen ovale stays open because of the flow of blood from the right atrium to the left atrium. As the lungs expand, blood flows easily through the lungs and the membranous portion of the foramen ovale (the septum primum) flops over the muscular portion (the septum secundum). If the closure is incomplete, the result is a patent foramen ovale. The two flaps may fuse, but many adults have a foramen ovale that stays closed only because of the pressure difference between the atria. Rokitansky (1875) explained congenital heart defects as breaks in heart development at various ontogenesis stages. Spitzer (1923) treats them as returns to one of the phylogenesis stages. Krimsky (1963), synthesizing two previous points of view, considered congenital heart diseases as a stop of development at the certain stage of ontogenesis, corresponding to this or that stage of the phylogenesis. Hence these theories can explain feminine and neutral types of defects only. Many congenital heart defects can be diagnosed prenatally by fetal echocardiography. This is a test which can be done during the second trimester of pregnancy, when the woman is about 18–24 weeks pregnant. It can be an abdominal ultrasound or transvaginal ultrasound. If a baby is born with cyanotic heart disease, the diagnosis is usually made shortly after birth due to the blue colour of their skin (called cyanosis). If a baby is born with a septal defect or an obstruction defect, often their symptoms are only noticeable after several months or sometimes even after many years. A number of classification systems exist for congenital heart defects. In 2000 the International Congenital Heart Surgery Nomenclature was developed to provide a generic classification system. Hypoplasia can affect the heart, typically resulting in the underdevelopment of the right ventricle or the left ventricle. This causes only one side of the heart to be capable of pumping blood to the body and lungs effectively. Hypoplasia of the heart is rare but is the most serious form of CHD. It is called hypoplastic left heart syndrome when it affects the left side of the heart and hypoplastic right heart syndrome when it affects the right side of the heart. 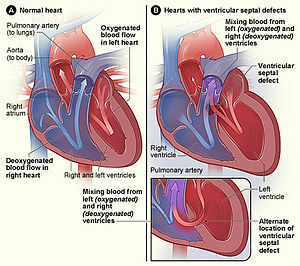 In both conditions, the presence of a patent ductus arteriosus (and, when hypoplasia affects the right side of the heart, a patent foramen ovale) is vital to the infant's ability to survive until emergency heart surgery can be performed, since without these pathways blood cannot circulate to the body (or lungs, depending on which side of the heart is defective). Hypoplasia of the heart is generally a cyanotic heart defect. Obstruction defects occur when heart valves, arteries, or veins are abnormally narrow or blocked. Common defects include pulmonic stenosis, aortic stenosis, and coarctation of the aorta, with other types such as bicuspid aortic valve stenosis and subaortic stenosis being comparatively rare. Any narrowing or blockage can cause heart enlargement or hypertension. The septum is a wall of tissue which separates the left heart from the right heart. Defects in the interatrial septum or the interventricular septum allow blood to flow from the right side of the heart to the left, reducing the heart's efficiency. Ventricular septal defects are collectively the most common type of CHD, although approximately 30% of adults have a type of atrial septal defect called probe patent foramen ovale. Cyanotic heart defects are called such because they result in cyanosis, a bluish-grey discoloration of the skin due to a lack of oxygen in the body. Such defects include persistent truncus arteriosus, total anomalous pulmonary venous connection, tetralogy of Fallot, transposition of the great vessels, and tricuspid atresia. Some conditions affect the great vessels or other vessels in close proximity to the heart, but not the heart itself, but are often classified as congenital heart defects. Some constellations of multiple defects are commonly found together. Most of the time CHD is serious and requires surgery and/or medications. Medications include diuretics, which aid the body in eliminating water, salts, and digoxin for strengthening the contraction of the heart. This slows the heartbeat and removes some fluid from tissues. Some defects require surgical procedures to restore circulation back to normal and in some cases, multiple surgeries are needed. Interventional cardiology now offers patients minimally invasive alternatives to surgery for some patients. The Melody Transcatheter Pulmonary Valve (TPV), approved in Europe in 2006 and in the U.S. in 2010 under a Humanitarian Device Exemption (HDE), is designed to treat congenital heart disease patients with a dysfunctional conduit in their right ventricular outflow tract (RVOT). The RVOT is the connection between the heart and lungs; once blood reaches the lungs, it is enriched with oxygen before being pumped to the rest of the body. Transcatheter pulmonary valve technology provides a less-invasive means to extend the life of a failed RVOT conduit and is designed to allow physicians to deliver a replacement pulmonary valve via a catheter through the patient’s blood vessels. Most patients require lifelong specialized cardiac care, first with a pediatric cardiologist and later with an adult congenital cardiologist. There are more than 1.8 million adults living with congenital heart defects. Heart defects are among the most common birth defect, occurring in 1% of live births (2-3% including bicuspid aortic valve). In 2013, 34.3 million people had CHD. In 2010, they resulted in 223,000 deaths, down from 278,000 deaths in 1990. For congenital heart defects that arise without a family history (de novo), the recurrence risk in offspring is 3-5%. This risk is higher in left ventricular outflow tract obstructions, heterotaxy, and atrioventricular septal defects. Congenital heart defects are known by a number of names including congenital heart anomaly, congenital heart disease, heart defects, and congenital cardiovascular malformations. ^ Hoffman JI, Kaplan S (June 2002). "The incidence of congenital heart disease". J. Am. Coll. Cardiol. 39 (12): 1890–900. doi:10.1016/S0735-1097(02)01886-7. PMID 12084585. ^ a b c d e "What Are the Signs and Symptoms of Congenital Heart Defects?". National Heart, Lung, and Blood Institute. July 1, 2011. Archived from the original on 27 July 2015. Retrieved 10 August 2015. ^ a b c d e f g h i j k l Shanthi Mendis; Pekka Puska; Bo Norrving; World Health Organization (2011). Global Atlas on Cardiovascular Disease Prevention and Control (PDF). World Health Organization in collaboration with the World Heart Federation and the World Stroke Organization. pp. 3, 60. ISBN 978-92-4-156437-3. Archived (PDF) from the original on 2014-08-17. ^ a b "What Causes Congenital Heart Defects?". National, Heart, Lung, and Blood Institute. July 1, 2011. Archived from the original on 8 July 2015. Retrieved 10 August 2015. ^ a b c Dean, SV; Lassi, ZS; Imam, AM; Bhutta, ZA (26 September 2014). "Preconception care: nutritional risks and interventions". Reproductive Health. 11 Suppl 3: S3. doi:10.1186/1742-4755-11-s3-s3. PMC 4196560. PMID 25415364. ^ a b c d "How Are Congenital Heart Defects Treated?". National Heart, Lung, and Blood Institute. July 1, 2011. Archived from the original on 27 July 2015. Retrieved 10 August 2015. ^ a b c d e f "What Are Congenital Heart Defects?". National Heart, Lung, and Blood Institute. July 1, 2011. Archived from the original on 13 August 2015. Retrieved 10 August 2015. ^ a b c Milunsky, Aubrey (2011). "1". Genetic Disorders and the Fetus: Diagnosis, Prevention and Treatment. John Wiley & Sons. ISBN 9781444358216. Archived from the original on 2017-02-22. ^ "Heart Defects: Birth Defects". Merck. Archived from the original on 4 August 2010. Retrieved 30 July 2010. ^ "National Heart, Lung, and Blood Institute". Archived from the original on 8 August 2010. Retrieved 30 July 2010. ^ a b Hoffman, J. (2005). Essential Cardiology: Principles and Practice. Totowa, NJ: Humana Press. p. 393. ISBN 978-1-58829-370-1. ^ a b c d Schoen, Frederick J.; Richard N., Mitchell (2010). "12. The Heart". In Kumar, Vinay; Abbas, Abul K.; Fausto, Nelson; et al. Robbins and Cotran Pathologic Basis of Disease (8th ed.). Saunders Elsevier. ISBN 978-1-4160-3121-5. ^ Thienpont B, Mertens L, de Ravel T, et al. (November 2007). "Submicroscopic chromosomal imbalances detected by array-CGH are a frequent cause of congenital heart defects in selected patients". Eur. Heart J. 28 (22): 2778–84. doi:10.1093/eurheartj/ehl560. PMID 17384091. ^ a b c Srivastava, D. (2006). "Making or breaking the heart: from lineage determination to morphogenesis". Cell. 126 (6): 1037–1048. doi:10.1016/j.cell.2006.09.003. PMID 16990131. ^ Jones, Kenneth Lyons (1997). Smith's recognizable patterns of human malformation (5th ed.). W.B. Saunders. pp. 316–317, 616–617. ISBN 978-0-7216-6115-5. ^ Niessen, K.; Karsan, A. (2008). "Notch Signaling in Cardiac Development". Circulation Research. 102 (10): 1169–1181. doi:10.1161/CIRCRESAHA.108.174318. PMID 18497317. ^ Spinner, N.; Hutchinson, A.; Krantz, I.; Kamath, B.; Pagon, R.; Bird, T.; Dolan, C.; Stephens, K. (20 July 2010). "Alagille Syndrome". GeneReviews. PMID 20301450. ^ Tidyman, W. E.; Rauen, K. A. (2009). "The RASopathies: developmental syndromes of Ras/MAPK pathway dysregulation". Current Opinion in Genetics & Development. 19 (3): 230–6. doi:10.1016/j.gde.2009.04.001. PMC 2743116. PMID 19467855. ^ "Factors Contributing to Congenital Heart Disease". Lucile Packard Children’s Hospital at Stanford. Archived from the original on 4 July 2010. Retrieved 30 July 2010. ^ Mills JL, Troendle J, Conley MR, Carter T, Druschel CM (June 2010). "Maternal obesity and congenital heart defects: a population-based study". Am. J. Clin. Nutr. 91 (6): 1543–9. doi:10.3945/ajcn.2009.28865. PMC 2869507. PMID 20375192. ^ Rasmussen SA, Galuska DA (June 2010). "Prepregnancy obesity and birth defects: what's next?". Am. J. Clin. Nutr. 91 (6): 1539–40. doi:10.3945/ajcn.2010.29666. PMID 20427732. ^ a b c d Larsen, William J. (1993). "7. Development of the Heart". Human Embryology. Churchill Livingstone. ISBN 978-0-443-08724-0. ^ Rokitarisky K. E. (1875) Die defecte der Scheidewande des Herzens. Wien. ^ Spitzer A. (1923) Arch. Pathol. Anat. 243, 81–272. ^ Krimski L. D. (1963) Pathological anatomy of congenital heart defects and complications after their surgical treatment. M., Medicine. ^ Thomas P. Shanley; Derek S. Wheeler; Hector R. Wong (2007). Pediatric critical care medicine: basic science and clinical evidence. Berlin: Springer. p. 666. ISBN 978-1-84628-463-2. Archived from the original on 2017-03-18. ^ "Hypoplastic Left Heart Syndrome". American Heart. Archived from the original on 11 June 2010. Retrieved 30 July 2010. ^ a b c "Congenital Cardiovascular Defects". American Heart. Archived from the original on 20 June 2010. Retrieved 30 July 2010. ^ "Ventricular Septal Defect". eMedicine Health. Archived from the original on 18 July 2010. Retrieved 30 July 2010. ^ "Circulatory Changes at Birth". University of California at Berkeley. Archived from the original on 18 July 2010. Retrieved 30 July 2010. ^ "Adult Congenital Heart Association". Adult Congenital Heart Association. Archived from the original on 20 June 2010. Retrieved 30 July 2010. ^ Canobbio, Mary M.; Warnes, Carole A.; Aboulhosn, Jamil; Connolly, Heidi M.; Khanna, Amber; Koos, Brian J.; Mital, Seema; Rose, Carl; Silversides, Candice; Stout, Karen (12 January 2017). "Management of Pregnancy in Patients With Complex Congenital Heart Disease: A Scientific Statement for Healthcare Professionals From the American Heart Association". Circulation. 135 (8): e50–e87. doi:10.1161/CIR.0000000000000458. PMID 28082385. ^ "Other Names for Congenital Heart Defects". July 1, 2011. Archived from the original on 27 July 2015. Retrieved 10 August 2015. Congenital heart disease information for parents.